In the greatest film ending of all time, Charlton Heston collapses in despair upon seeing the Statue of Liberty half-buried in sand, instantly realizing that the Planet of the Apes is, after all, Earth. Imagine how less dramatic this climax would be had it taken place in the great ape library, Heston reading the troubling news in a dusty textbook. Words have power, but objects have objectivity. In Tokyo, the physical remains of World War II are few and far between, largely because many of Tokyo’s wooden buildings were incinerated during the 100-plus firebombing attacks. During the attack of March 9-10, 1945, one million people were left homeless, and 100,000 perished. 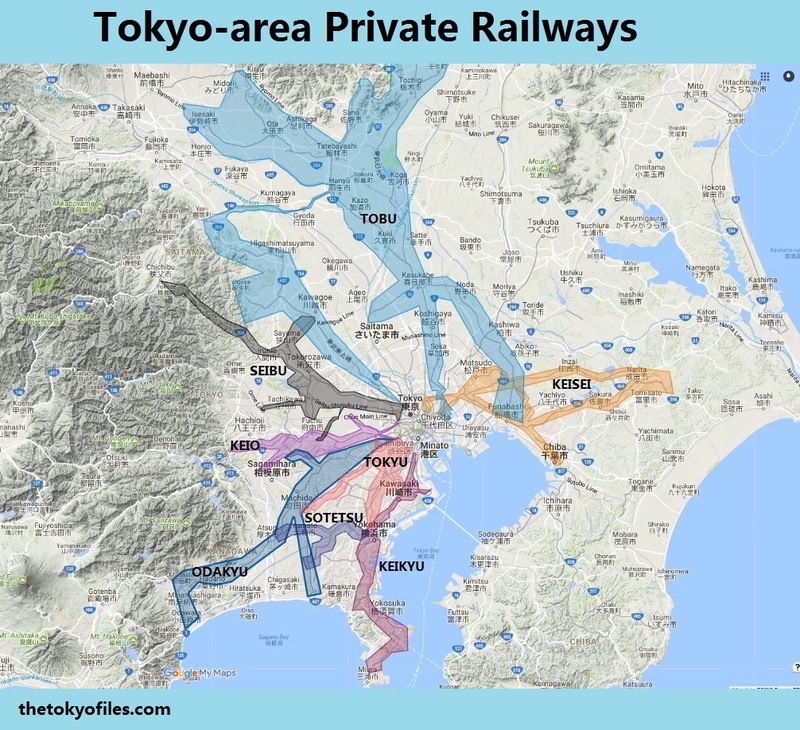 In total, the American raids would destroy roughly half of central Tokyo. How can you see the damage inflicted on things that cease to exist? I visited the The Center of the Tokyo Raid and War Damages museum in Tokyo’s Koto-ku ward 江東区, located in the center of the fierce March 9-10 attack. The center’s mission is to promote peace through studying the horrors of war, with particular focus on the Tokyo firebombings (which are overshadowed by the atomic bombings of Hiroshima 広島 and Nagasaki 長崎). The museum is modest, but so is the admission fee, at just 300 yen, and its collection relating to the Tokyo firebombing includes maps and photographs of the damage, American military planning documents, and household items pulled from the fire’s ashes. The exhibits come across as very matter-of-fact, allowing the viewer to decide on the appropriate moral or emotional response. The most memorable part of my visit is watching a video of the March 9-10 firebombing. A time-lapse map of the conflagration (see above and below) illustrates the incredible size of the fire, which would grow to 16 square miles (41 km2). Images of the aftermath include charred bodies and barren cityscapes. Meanwhile, I’m sitting next to an elderly couple who, by my math, would have been ten years old at the time of the attacks. The video includes footage of bombs spewing from shiny planes; the patriot in me cheers the Americans to victory until I realize I’m sitting directly where those bombs will land, just 68 years later. A similar version of this video is available on YouTube, and is worth watching. In a moment of black comedy (at 4:25), the Japanese interviewer asks a B-29 pilot “what was in his mind” when he was dropping bombs, to which he replies, “happy, happy”. 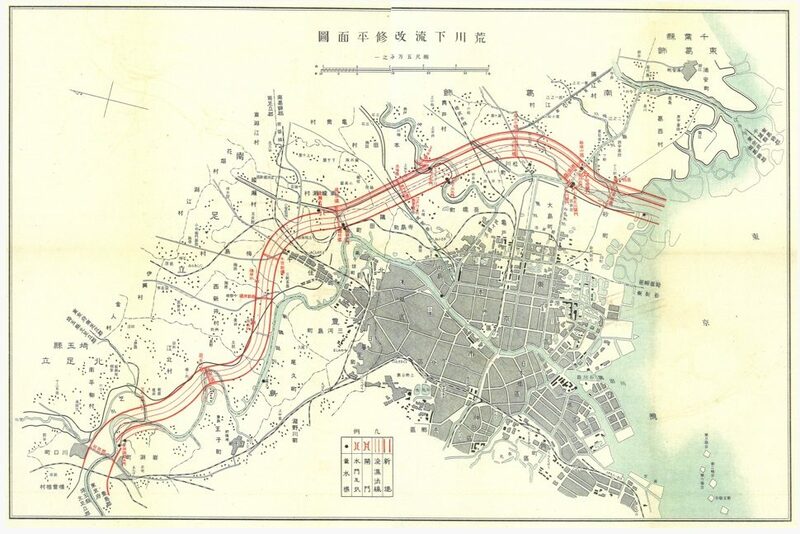 Tokyo air-raids, firebombing damage map. 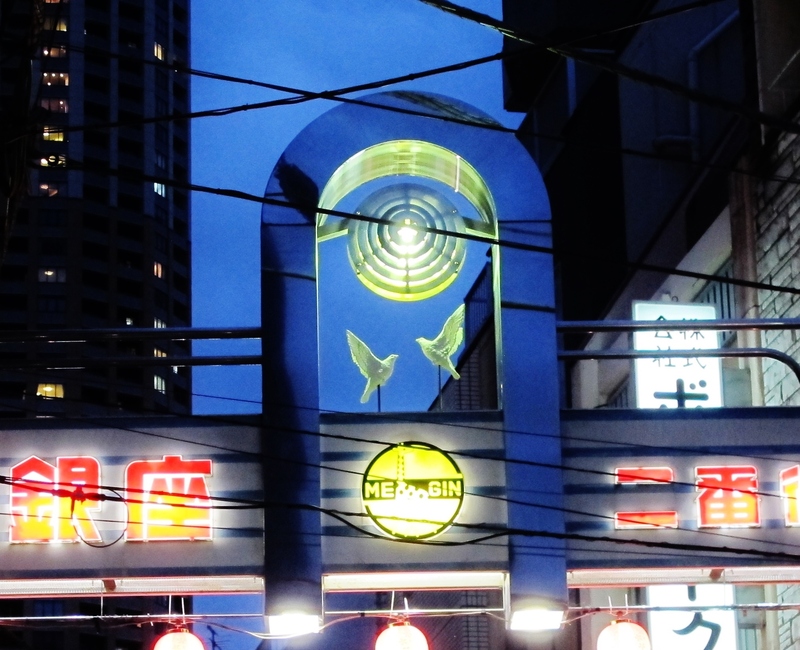 If bombs don’t make you happy, happy, head west to Tamagawa-Jōsui 玉川上水駅, about 1 hour from Tokyo station, and count the bullet holes on the Hitachi Aircraft substation, which was strafed by American gunfire during the war. The building, which supplied power to an airplane engine factory, was attacked three times in 1945: February 2 by Grumman F6F Hellcats, April 19 by P-51 Mustangs, and April 24 by B-29 bombers. The adjacent factory was destroyed by the raids, but the substation, despite absorbing considerable machine-gun damage, supplied electricity to the rebuilt factory until 1993. No structure in Tokyo bears the scars of war more visibly than this building, which makes a visit worthwhile for anyone moderately interested in WWII history. 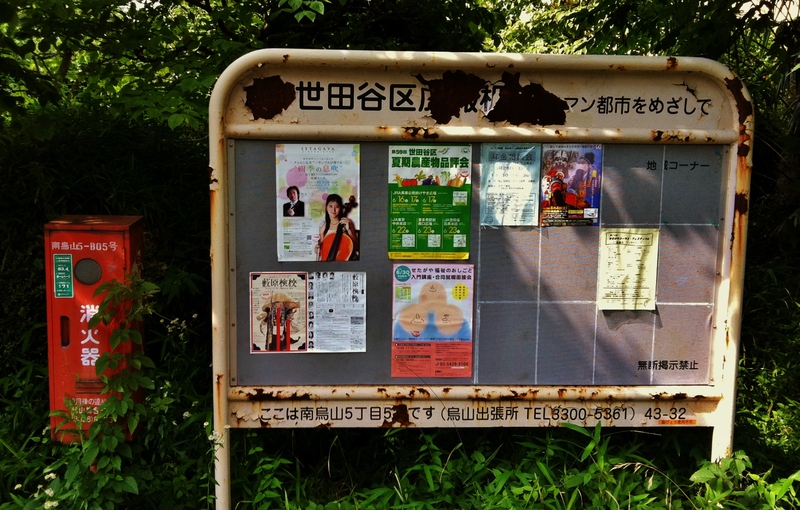 Additionally, the structure is situated on the northwest edge of Higashiyamato-Minami Kōen 都立東大和南公園, which is a particularly pleasant park. When I visited, the running track was full of traffic, children eagerly kicked soccer balls, and a boy played the French horn, all appropriate pursuits for a day without machine-gun strafing. Model of a Kawasaki Ki-61 Hien “flying swallow”, a.k.a. Ki-61 “Tony”) at the OHSAWA Wartime Concrete Aircraft Hangars in outer Tokyo. Eight miles southeast of the Hitachi substation is the last stop on our journey, home of two airplane bomb shelters, the Wartime Concrete Aircraft Hangars “OHSAWA 1 & 2” 掩体壕大沢1号、2号. The site, Tokyo Chofu Airfield 調布飛行場, opened in 1941 to provide air defense against B-29 attacks, equipped with Kawasaki Ki-61 Hien “flying swallow” fighters キ61三式戦闘機「飛燕」. As the end of the war drew closer, the Japanese increasing prepared their homeland for an expected invasion. Thirty concrete hangars were constructed in 1944 to protect the “flying swallows”. Short on manpower, construction was aided by a local gardening group and junior high students, according to signs at the park. Too much war for you? On a clear day you can view Mt. Fuji, or walk east a few hundred yards to visit the late Edo-era Mitaka Osawa-no-sato Waterwheel farmhouse 大沢の里水車経営農家・新車（しんぐるま） (map), located on the banks of the Nogawa (River) 野川, one of the greenest, wildest, and most relaxing rivers in Tokyo. Furthermore, the Nogawa is one of the only rivers in Tokyo where you can climb down from the paved sidewalk and walk in the grassy riverbed. Not a bad place to go to forget about war. 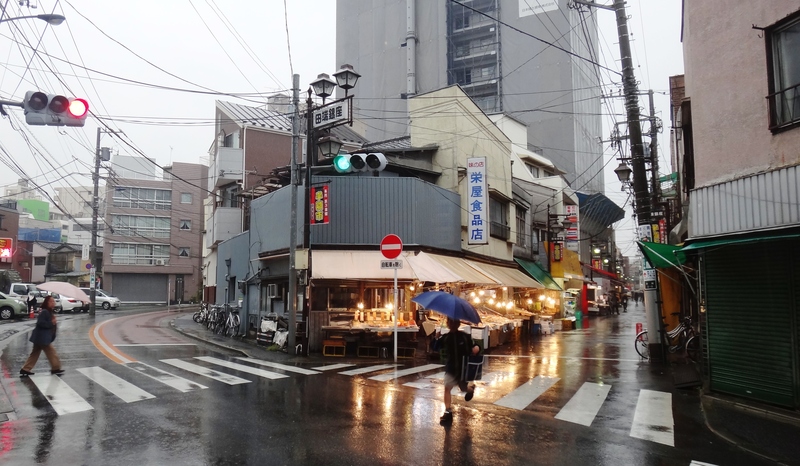 The final spot on this list goes to the most centrally-located: Kamakura-bashi (bridge) 鎌倉橋. This stone bridge in central Tokyo bears the scars of American air-raids carried out in November 1944. Although there are traces of about 30 bullets, the evidence can be confused for the natural wear and tear of an old structure; I wouldn’t have noticed the bullet marks had it not been for the historical marker that commemorates the site. Due to the bridge’s proximity to Tokyo Station, any history buff with a few extra minutes to spare might find the Kamakura-bashi to be worth a visit. It’s about a 10-minute walk from Tokyo Station (~900 meters / half a mile), or a 1-minute walk from the A1 & A2 exits of Otemachi Station. The Asahi Shinbun recently published an article disclosing evidence that the Japanese were also (in addition to the Germans) advanced in their quest to invent an A-bomb. It’s quite possible that the outcome of WWII would have been entirely different had either of our enemies been successful before we (Americans) were.